A review that covers Crop King's reputation, strain selection, seed quality, customer service, seed discounts, promotions, and more. Crop King Seeds is a Canadian seed bank with a unique history. The company originally started in the early 2000’s, but had to close up shop in 2005 due to the uncertain future of Canadian cannabis laws. After a long hiatus, Crop King Seeds cropped up again – this time in the US, where a few states like Colorado and Washington had recently voted to legalize cannabis. From there, the business grew and grew until the Canadian climate was ready to welcome them back again with open arms. In the early part of 2013, Crop King Seeds returned home and put down roots at their first physical storefront in Calgary, in the province of Alberta, Canada. They now ship seeds from their main office in Vancouver, as well as selling them through over 100 retail partners that have physical storefronts. With recreational cannabis now legal all throughout Canada, the sky’s the limit as to how far Crop King can grow. Since their inception, the team at Crop King Seeds has been dedicated to growing their business by offering unparalleled product and top-tier customer service. In addition to this, Crop King has become a source of constant innovation in the marijuana industry. Over the years, they’ve gone from a small seed-shop to a full-blown brand with a loyal base of dedicated customers. In 2019, this Canadian seed bank has climbed to the top of the pack. Read on for the full review of this unique seed bank! Crop King Seeds is widely regarded as one of the top seed banks in the industry. They consistently deliver quality products in a professional manner, and it’s obvious that they really do care about the satisfaction of their customers. They even have their own customer guarantee which states that they will always stand by their product, since their seeds are hand-picked, inspected, and tested to ensure that they are mature and viable. They also have a shipping guarantee that ensures that if your order fails to arrive, they’ll resend the seeds until it reaches you. That alone is reason enough for a good review. These extensive guarantees are definitely not the norm in the industry, and it just goes to show that the people at Crop King Seeds are always willing to go above and beyond the call of duty for their customers. They also have more than 100 physical retail stores selling their seeds across Canada, in addition to shipping worldwide from the main Crop King Seeds office in Vancouver, Canada. That is an impressive feat in the world of online seed banks! In reality, Crop King Seeds is in a different category from most other seed banks that sell almost exclusively through their websites. Crop King Seeds sets itself apart as an established business with real people behind it that you can meet face-to-face. That is a true rarity in the cannabis seed industry. In fact, Crop King was an established retail shop before they made the transition to online selling. Crop King Seeds proudly sells their products all over Canada, and people eagerly buy them from all over the world. This makes them a highly-recommended seed bank and source for all your growing needs. Overall, customers agree that Crop King Seeds is a great place to buy seeds and have peace of mind that your order will be delivered to you in a timely manner and the seeds will be as expected – or even better! Crop King Seeds – Sold in over 100 stores in Canada. The selection at Crop King Seeds encompasses a good variety of strains and seed types. They have more than 30 different strains available currently (as of 2019), all of which they have cultivated themselves. Many of these are original strains that have been bred exclusively by Crop King Seeds – strains you can’t get anywhere else. Crop King sells seeds in a variety of categories, including regular, feminized, auto-flower feminized, dwarf auto-flower feminized, medical/high CBD, and a few mix-and-match packs. You can search through all the strains by seed type, which is a handy feature if you’re looking for something specific. Some of their most-renowned strains include Blueberry, Afghani, Dark Angel, Purple Kush, White Cookies, Sour Diesel, Green Crack, Candy Cane, Northern Lights, Amnesia Haze, and Train Wreck. Of course, they also sell a lot more than just these few varieties. Taking a quick scroll through their product page, you can see that they have a little something for everyone. Whatever it is that you like, you’ll be able to find something that suits you at Crop King Seeds. And on the off chance that you don’t see anything that tickles your fancy, just keep checking back periodically because the grow experts at Crop King are constantly coming up with new strains to offer in their shop – but only after proper testing and quality assurance, of course. In short, the seed selection at Crop King Seeds may not be quite as extensive as the selection at some other seed banks, but it is well-curated. This means that while other shops may pad out their listings with seed strains of varying qualities, when you buy from Crop King Seeds, you can be sure that everything you see in their shop is of the very highest quality. 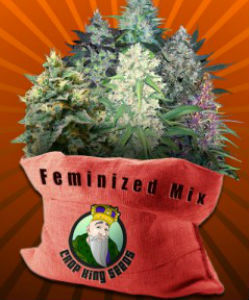 Over the years, cannabis growers have been very impressed by the quality of Crop King Seeds. You will be too, if you try them out for yourself. There’s very little risk involved, since Crop King Seeds offers all of its customers a guaranteed germination rate of 80 percent. This kind of guarantee is quite unheard-of in the cannabis seed industry. Most other seed banks won’t even publish their own germination rates, let alone offer their buyers a guaranteed rate! If you order from Crop King and find that your germination rates aren’t up to snuff, all you need to do is get in contact with any member of their friendly customer service team and they will send you new seeds to replace the bad ones. This is an unprecedented level of customer service for a cannabis seed bank. It’s obvious that Crop King Seeds is 100% committed to providing the best possible products to their customer base. If they weren’t, they definitely wouldn’t be offering to replace sub-par seeds at their own cost. This commitment to quality lets their customers buy with confidence, knowing that they’ll always get the best from Crop King. Crop King Seeds is not only an online shop – you can also find their seeds being sold at dozens of retail stores across Canada. Especially for those that are used to buying seeds exclusively online, it can be very interesting to be standing in a brick and mortar store, surrounded by all the actual products that you can see, smell, touch, and discuss with a knowledgeable sales associate who is right there beside you. It’s definitely an experience worth having if you live or travel in Canada. For those of you outside of Canada, don’t worry! Crop King ships worldwide, so you can buy their seeds from anywhere. The website is informative and well-organized, with information on each strain, strong search and filter features, and even guides on how to get started with growing your seeds. There is also a forum where you can chat with other Crop King Seeds customers and ask questions, read reviews, or get advice. If you need more immediate assistance, the website also has a live chat feature that puts you in contact with a knowledgeable sales associate right away. They can help you choose the perfect strains for your needs, right from the comfort of your own home. One of the coolest things about finding a seed bank like Crop King is taking advantage of the special offers and promotions they offer from time to time. People on the lookout for Crop King Seeds coupon codes and special sales should take time to sign up for their newsletter to stay in the loop about ongoing promotions and events. Another great way to stay on the lookout for Crop King sales is to follow them on social media. If you don’t want to wait for a sale, you can always maximize your cannabis seed dollar by buying in bulk. Crop King strains are available in 5, 10, and 25 seeds. The larger packs are a better value, so if you’d like to grow a lot of a particular strain, it’s best to buy a 25-pack and save some money. For a massive selection of discounted cannabis seeds available for worldwide shipping, see the MSNL Special Offers Page. The customer service at Crop King Seeds will absolutely blow you away. They are the driving force behind Crop King’s many generous customer guarantees, including their germination guarantee and their guaranteed delivery. It’s likely you’ll never have to talk to them if you never have a problem, but if something does go wrong with your order, they will be fully dedicated to making it right for you. Just call, email, or chat and you’ll be connected with a real, friendly person who will listen to your issue and find the best solution for you. In fact, their amazing customer service team is one of the main reasons that Crop King doesn’t work with any other online resellers- they would hate for you to have a bad experience with a reseller’s customer service and have it color your opinion of Crop King Seeds! Plus, since Crop King ships worldwide and accepts a variety of payment options already, there’s not really much reason to go through resellers. Buy directly from Crop King’s website for stellar customer service and to guarantee that you’ll be receiving genuine Crop King Seeds. For those who can’t make it to one of the retail stores that carry Crop King products, the company ships worldwide with a few different shipping options. $10 shipping is available to customers in Canada, The United States, Australia, and New Zealand. It costs $30 to ship to all other countries, and this rate guarantees your delivery, even in cases of government seizure which make up about 5% of orders. If your order is seized, it will be re-shipped until it is delivered successfully. Guaranteed delivery to Australia and New Zealand cost $60 and can take up to 3 weeks. Most other international orders will be delivered within two weeks from the date of shipping. Orders shipping within Canada will be packaged in the original Crop King packaging. International orders will be stealth packaged, with the seeds safely tucked away in random objects like pens, flashlights, or birthday cards. Crop King Seeds payment methods include Bitcoin, Visa, and Mastercard. Interac E-Transfers are available for Canadian customers only. Although Crop King is a Canadian seed bank, all prices are displayed in US dollars and will be processed in US dollars for any order placed from outside of Canada. For those who can’t purchase Crop King seeds in person, the company ships worldwide from their website. It’s nice when a company has an amazing selection of strains, high-quality cannabis seeds, and amazing customer service. What’s even better is when their customers get to meet and greet the team behind the brand face-to-face. This is why it’s so much fun to see the Crop King Team at work (and play) at 420 events around the globe. Crop King can be found at the the annual O’Cannabiz Conference & Expo, the premier international business conference for the cannabis industry. They’re also an annual sponsor of the Indo Expo, a full-spectrum B2B cannabis trade show, as well as the HempFest cannabis expo. The team has also made appearances at the Kushstock Festival, a marijuana celebration with free general admission for the masses. If you’re at a 420 event, keep your bloodshot eyes open; chances are that you’ll see the Crop King team there! 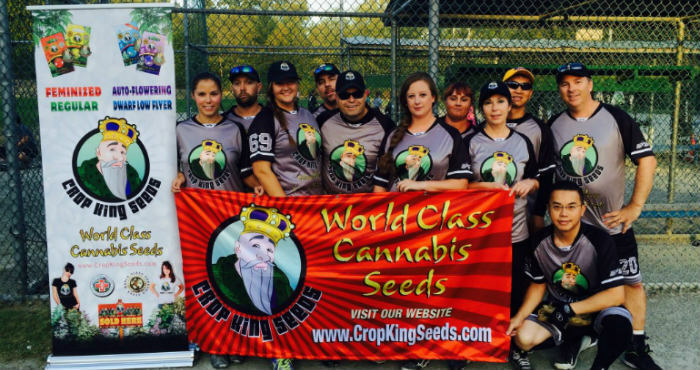 The Crop King Seeds team can be found at 420 events around the world. One of Crop King’s most notable and unique accomplishments was making and airing what was possibly the world’s first professional cannabis commercial. It is just over a minute long and features a dramatization of a common argument among marijuana legalization proponents – that alcohol is a more dangerous drug than marijuana, yet it is legal and weed is not. Since this commercial aired in 2014, Crop King Seeds has made several more to complement it, and will likely continue to do so well into the future! 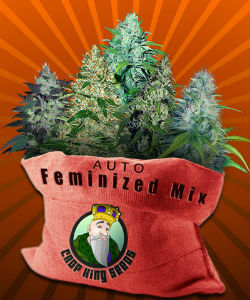 For more awesome stuff, see the Crop King Seeds media publications page. 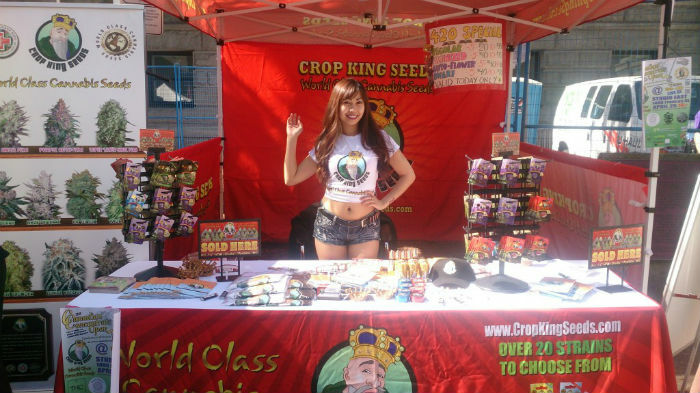 To summarize, Crop King Seeds is a highly trusted, reputable seed bank that stands behind its high quality product. They ship worldwide and accept many different types of payment. They even guarantee your delivery and favorable germination rates! Really, the only negative thing about Crop King Seeds is their somewhat limited selection, but hopefully, that will be remedied as they expand and add more strain varieties in the future. It may not be the place to try out a ton of new strains, but Crop King will always be a reliable source of high-quality seeds when you need to stock up on your favorites or try something that’s guaranteed to grow well. Discounts and Special Offers on a Massive Selection of Cannabis Seeds with Worldwide Shipping!